A place far from the urban center and in an austere environment, becomes a challenge. Faced with such an action, lacking any type of reference that conditions the operation to be developed, architecture must be able to activate this non-place. By means of the implementation of a new element, the space destined for the new intended use has to be modified and strengthened. It is a fairground, a pavilion. An element that has become a reference within the landscape of the city of Cáceres. A symbol of a city aspiring to European Capital of Culture. The challenge is twofold, to achieve an effective and efficient artifact, and at the same time to create a unique element capable of being recognized and remembered by the visitor. An opportunity to make a gift, a possibility that should be exploited. The pavilion understood as a meeting space. A whole series of events, commercial, cultural, sports ... must be held in a place that is able to respond to the particular needs of each use. A large space, free of obstacles and allowing multiple configurations inside. Generate a large common space, surrounded by bodies understood as uses associated with its operation, all of them under a continuous element that protects and gives shade to visitors. 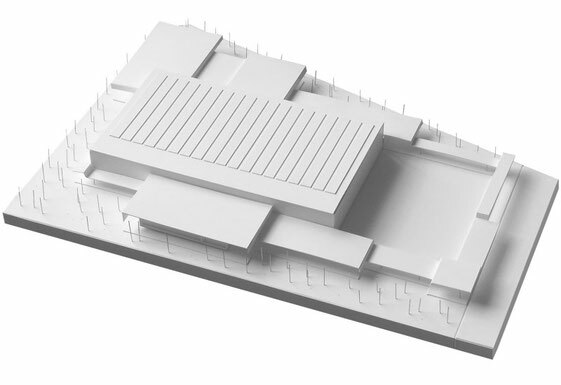 An energetic roof as a shade that defines and defines the image of the building. This is the premise under which the project for the new Cáceres fairground was born. The parcel of the contest is divided into two parts. The west sub-plot will be used for the creation of an open-air car park, which in turn allows for the holding of fair exhibitions abroad. In the sub-plot this will be located the building for the fair of Cáceres. The project is configured through three actions. The first is the definition of the central exhibition space, the second the positioning of the uses associated with its surroundings, and the third and most important, the generation of a continuous element that unifies the project and generates a series of covered outdoor spaces, protected in shade, which in turn originates a characteristic silhouette of the new fairground. Based on the basic idea of the project, the common exhibition area is positioned in the plot at a point of equilibrium between the boundaries of the same. 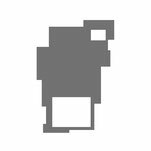 It is understood as an abstract parallelepiped in whose interior three possible spaces appear. The first is the main lobby or multipurpose space. It is a large distributor in which you can project images on your walls and access to the large common exhibition space. This is surrounded by a large chamber of facilities, as if it were a perimeter gallery of services. The common space can be divided into two parts by means of a mechanism of acoustic mobile panels. Once the center of gravity of the proposal is recognized, the so-called associated uses are organized around it. The areas of access, daycare, assembly hall, cafeteria and warehouse are what make up these elements. These are volumes that serve the central body, but can be operational at different times than the exhibition space of the fair. The relations between them and with the common exhibition space, condition their exact position in the plot. The remaining exterior space up to the limits of the performance is conceived as a small dehesa in which outdoor exhibitions can be held. The relationship with the inner core is configured through a series of steps that communicate the interior and exterior visually and directly. It is understood that a fairground can not and should not be isolated from the outside. The direct contact of the visitor with the outside generates a kinder relationship between the environment and the building, while greatly expanding the exhibition possibilities of the site. The third element allows to understand the generating idea in its entirety, so that the result is a complete proposal. That is, including all the elements necessary for the proper operation of the fair in the first instance, and in turn, responding to the expansion needs provided in the rules of the contest. It is a cover that is configured adapting to the geometry of the plot and the proposed volumes. The broken profile of the roof evokes the multifaceted character of the building, serving as an element that guides the visitor to the point of access and, like a shady, protects him from the sun and gives shelter, generating covered outdoor spaces. 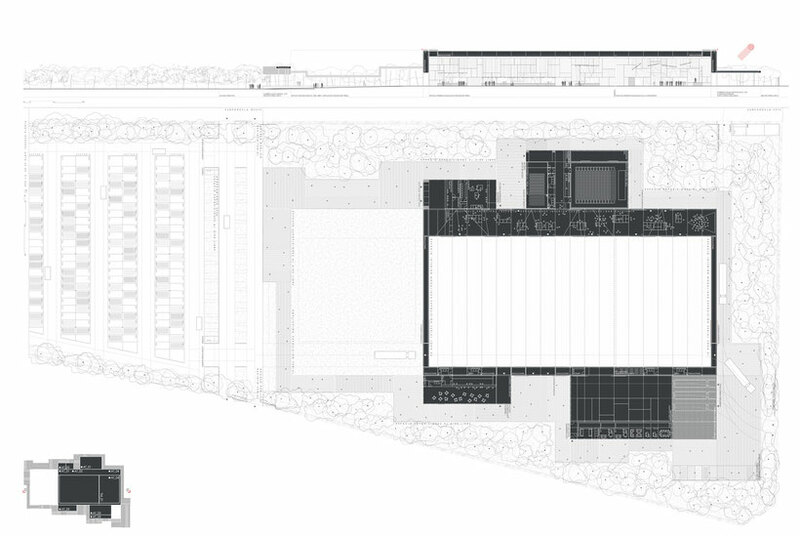 At the same time, it delimits the space proposed for the extension of the exhibition, creating an interior-exterior courtyard tangent to the fairgrounds, which allows the celebration of outdoor exhibitions. The human scale in a building of these dimensions, remember that people are the main beneficiaries of this proposal. Architecture must respond to the needs demanded by the proposed program, taking into account the various socioeconomic circumstances in which it is framed. The current situation requires a responsible and honest action, consistent with the economic situation we suffer. It must also be able to generate situations and places that are remembered. This is the true ambition of the proposal. Create intermediate places, outdoor spaces under shade, interior spaces before the interior exhibition core; that prepare and accommodate the visitor to enjoy the new fairgrounds of the city of Cáceres. An area endowed with the technology, quality and warmth necessary to make this city a benchmark in the celebration of exhibition events at Spanish and European level.